In early 2017 I inherited one of these FSL’s courtesy Tony King of the NZRDXL. Other commitments left it lying for some months in my radio workshop, but gave time to decide what best to do with it. It was eventually decided that it would make a very portable antenna to take away in our caravan when holidaying. Given that it is a smaller sized caravan it seemed appropriate to make it remotely tuned using varactor diodes and with a link winding to match it to 50 ohm coax so it could be placed outside. It needed to be made waterproof to handle adverse weather conditions. My coaxial loop antenna already had a remote tuning unit built up, so it made sense to use this. It has 50 ohms in and out and has capacitive isolation to allow the 0 – 9 volt dc tuning voltage to be fed up the coax to tune the FSL. As Tony had glued most of the pipe fittings I thought it best just to make pipe cuts at 2 places. Some of the surplus pipe tees were cut and used for the support pipe with little waste. 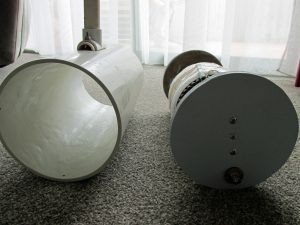 Perhaps at a later date I may shorten the supporting central pipe and thus reduce the width of the outer PVC enclosure. PVC pipe was chosen as this is both waterproof and at the same time provides mechanical protection for the fragile rods enclosed. The 2 end pieces were made from exterior grade treated multi-ply to made the circular cuts easier. The pictures show how the modification was carried out. The finished project works very well indeed. The remote tuning is achieved by using two high capacity varactor diodes (25 – 560 pf) connected in series giving a net capacity of 12.5 – 280 pf. 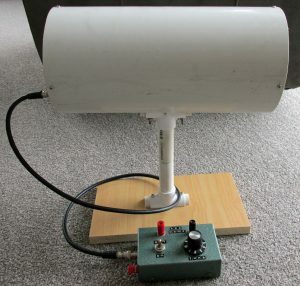 This effective capacity allows the FSL to be tuned over the range 530 khz to 1700 khz using 0 – 9 volts. 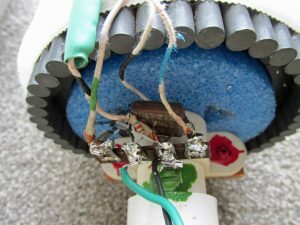 The 50 ohm coax is connected to a 2 turn link winding but this could also be made 1 turn. 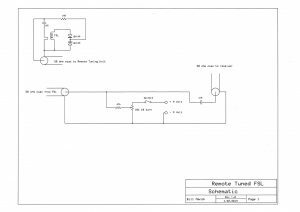 The remote tuning also has the added advantage of eliminating hand capacitance which can be significant using the original tuning capacitor at the HF end where small changes in capacity can effect the sensitivity of the FSL. 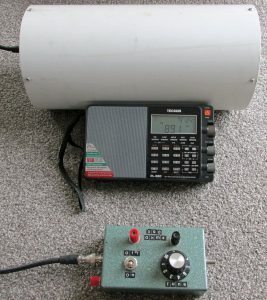 Obviously it can be used as previously intended with a World Band radio provided the FSL is rested on a non-magnetic table top etc. The clearance between the outer pipe jacket and the FSL coil is at a minimum so the portable receiver can be placed very close to the FSL coil with no reduction in sensitivity compared to the original setup. Because the output from the FSL is 50 ohms it can also be used with a conventional communications receiver if required. You just have to get used to peaking the FSL with frequency change. 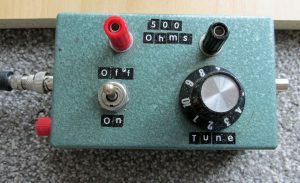 It can have a preamp connected if using a communications receiver for that little extra signal (+ noise) gain. It also works well with an SDR provided you appreciate that due to the extreme selectivity of the FSL the SDR spectrum will be quite narrow and each change of frequency will require the FSL to be peaked as for the conventional communications receiver. 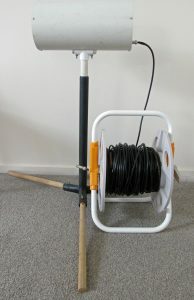 The exterior stand in the photos is from my co-axial loop antenna making further utilisation of this on this project. As an aside the World Band radio displayed is a Tecsun PL-880 with SSB. I have also had the opportunity to test Gary’s design against my own “Kiwi Build” FSL (shown on this website). 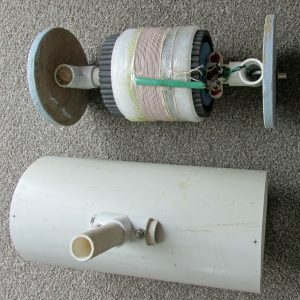 My FSL uses flat 4 inch Ferrite rods but the outer diameter is larger. I am happy to report that my own FSL made from surplus rods is up there with Gary’s and is only about 1-2 dB less sensitive. The two FSL’s display different characteristics to noise and swap places at times depending on the noise environment. 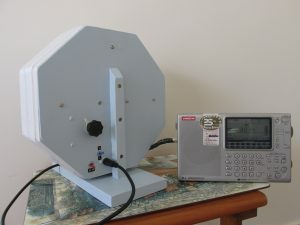 Both provide MW DX indoors and perform extremely well in chosen locations. Where can I find a diagram ?